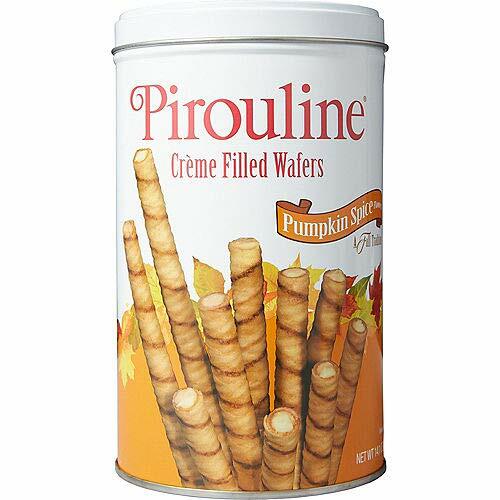 Exclusive Pirouline Pumpkin Spice Creme Filled Wafers! Limited Quantities Left! Heavenly Flavor! You Can't Just Have One! Great For Parties, Desserts, Snacks, Or With Ice Cream! Satisfies Any Sweet Tooth And Great For All Ages! Toasted For Your Tasting Pleasure! Heavenly Flavor! You Can't Just Have One! Great For Parties, Desserts, Snacks, Or With Ice Cream! Satisfies Any Sweet Tooth And Great For All Ages! Toasted For Your Tasting Pleasure! If you have any questions about this product by Peter DeBeukelaer Baking Company, contact us by completing and submitting the form below. If you are looking for a specif part number, please include it with your message. PIrouline Creme Filled Wafers Dark Chocolate 14.1 Oz. Pack Of 3.